Lyx is a free word document processor that takes the pain out of formatting your documents. 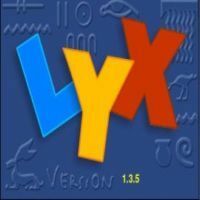 Unlike other word processors that require you to do a lot of formatting, this one, created by the Lyx development team has taken care to make sure everything looks great from the start. Not only that, this program is also packed with some sweet features. Lyx has a lot features ranging from math and science to creating documents, tables, and graphics. You can import Word, RTF, html ASCII, PDF, LaTEX, Postscript and many more. You can also send a fax from within the program. Lyx supports change tracking and it can compare different document versions plus you can make virtual sticky notes, perfect when you want to jot something down quickly. One of the program�s biggest strengths, however, is in it’s structured document creation. If you�re creating long complex documents you will find features like bibliography, index, references, and labels very useful. Of course standard features like spell checking, cut/paste, opening multiple documents, undo, redo revision tracking and thesaurus can all be found here as well. If those features are not enough, Lyx has support for different text classes so you can type LinuxDoc, presentations, movie scripts books, articles, letters and more. In addition, text classes for sciences societies are supported as well. Speaking of science, you can enter equations via point and click and it has a powerful math formula editor as well. Algebra systems are supported as well as algorithms, customizable math macro, equation numbering, and arrays and a whole lot more. While Lyx�s set of features may seem intimidating it really isn�t since its graphical user interface is very intuitive and the menus clearly show where the functions are.